Azzurra TP52 wins once again on American waters thirty years after her debut in Newport, RI. It was in 1983 when Italians fell in love with sailing and that blue boat that matched the color of the sea. It seems today that history has repeated itself. Azzurra, the modern and technologically-advanced Transpac 52 that flies the colors of Yacht Club Costa Smeralda, won with great authority in Key West the first stage of the 52 Super Series, the most important worldwide professional sailing circuit on monohulls. This morning and with two races to go for the conclusion of the event, Azzurra was at the top of the leaderboard, tied on points with Ran and with a mere one-point advantage over Quantum. Key West lived up to its promise once again and offered a perfect race course with blue skies and 15 knots of wind. Azzurra's crew reached perfection as well in the first race and scored a victory that would guarantee the overall event, save any unfortunate withdrawal in the last race. Since the winner of the 52 Super Series is decided based on the scores of each single race and not the number of events won, Azzurra hit the starting line in the second race determined to further extend its lead over its opponents. Azzurra's second place in the race, behind Interlodge and ahead of Rio, both Americans, now stretches its advantage over Ran and Quantum, its direct opponents, to 7 and 8 points respectively. Zennström and De Voos, owners of the two boats that had a negative day, personally congratulated Roemmers, Azzura's owner, showing the true sport spirit of the 52 Super Series. 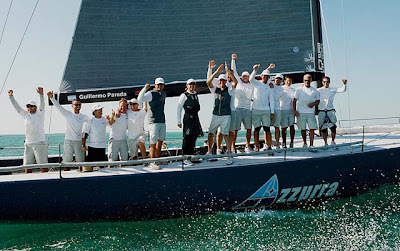 The Yacht Club Costa Smeralda congratulates its member owner of Azzurra and the entire crew for a result that is in continuity with the victory in 2012. Here is what some of the day's protagonists had to say while celebrating their well-deserved victory on the dock.